Countless famous faces from Spike Lee to Naomi Campbell have been framed by luxury eyewear brand Oliver Peoples. With their quality and craftsmanship, a discreet and timeless logo, and a mission “to be the most prestigious and culturally distinctive eyewear company in the world,” it doesn’t take an eye exam to see why. 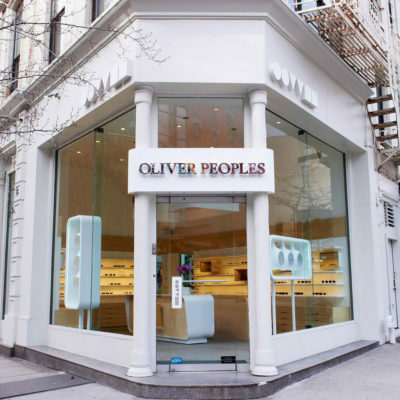 Their SoHo retail location on Broadway is outfitted with knowledgeable salespeople that are well-equipped to help you scour the offerings of Oliver Peoples, Mosley Tribes, and Paul Smith lenses. The inviting, modern and minimalist setup coupled with ambient music and a super laidback yet uplifting energy make it easy to relax and focus on a good fit. A looking glass to earlier decades, Oliver Peoples features a wide array of optical choices with a vintage feel, as well as oversized sunglasses with photochromic or polarized lenses, yet a timeless hipness unites them all.